Perjury allegations! "Trained killers!" Sorry, kids, the roller coaster of crazy that is the Kurt Busch ex-girlfriend domestic assault protective order hearing is about to end, but thankfully, the closing arguments still delivered our regularly scheduled dose of nuts. 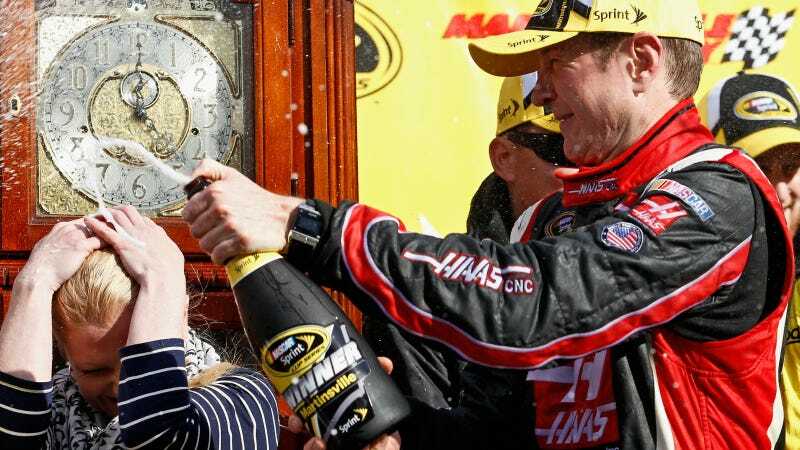 The hearing is regarding a protective order requested by NASCAR driver Kurt Busch's ex-girlfriend Patricia Driscoll for an incident that allegedly happened at Dover International Speedway. Driscoll claims that Busch hit her head against the wall three times when she stopped in to check up on him in his RV at the track. Busch claims Driscoll's visit was unwanted and uninvited, particularly as he was naked at the time. Busch told the Dover, Del., police that he cupped his hands around her face as if to kiss her, told her to leave the RV, and her head tapped the wall (only once, and just a tap) somewhere in the process. According to USA Today, the police have not yet announced if they are pursuing any criminal charges related to Driscoll's allegations. This week, both parties filed their closing arguments. On Wednesday, Busch's lawyers alleged that Driscoll committed perjury on the stand, making up stories of how Busch abused her in order to destroy his reputation. Busch has a bit of a reputation as a hothead already in NASCAR, but a domestic assault allegation certainly tips it over the edge. Busch's legal team also kept hammering on the assassin story. In his closing argument, Busch's lawyer stated that Driscoll had told "legions of people" that she was a trained killer, but she didn't want to deny it under oath because she knew more people would come forward to confirm it. Driscoll's lawyers rebutted those closing statements today, stating that she did deny the assassin claim in a cross-examination. Driscoll also called the allegations "ludicrous and without basis" to the Associated Press shortly after Busch and others testified about her flaunting her role with the government. She, uh, sort of did before this procedure began. Assassin? We can't say for sure, but she was pretty cool with being called a "Pocket Commando." "I suggest instead that Respondent (Busch) does not have a public relations problem; he has a domestic violence problem," Driscoll's lawyer Carolyn McNeice wrote in the rebuttal, as quoted by USA Today. "He committed an act of abuse and the Court should find in Mrs. Driscoll's favor." Naturally, Driscoll's legal team claims that the allegations of her being an assassin are just meant to ruin her reputation and distract from the more serious allegations that Busch abused Driscoll. In addition to the protective order to keep Busch from contacting her, Driscoll is also asking for Busch to undergo a psychiatric evaluation and an assessment from a domestic violence treatment agency. A ruling is expected in the next few days.